This post originally appeared on my blog, Celtic Voices. 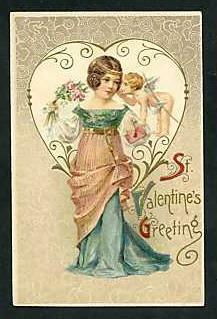 A Victorian ValentineHappy St. Valentine’s Day!You’ve probably read on other blogs that there were at least three martyred saints named Valentine, one of which is said to have died on February 14, thus the date of this observance. You may have read that just like other church observances, this one was set to coincide with a pagan festival, to draw attention away from it, in this case a fertility feast. You’ve probably also read that the exchange of valentine cards originated during Victorian times. But did you know about the Irish connection? In the nineteenth century there was a Carmelite priest who was well known for his preaching and his service to the poor. Fr. John Spratt helped establish the Irish Carmelite order and was responsible for acquiring for the church the property that had once housed a 13th century Carmelite monastery on Whitefriar Street in Dublin in 1825. He visited Rome in 1835 and was invited to speak to the Jesuits the following February and was transported there in the carriage of the Cardinal who was the Pope’s advisor on affairs in England and Ireland. He visited more cities but somehow on that journey he was awarded with the relics of a 3rd century martyr, Saint Valentine. 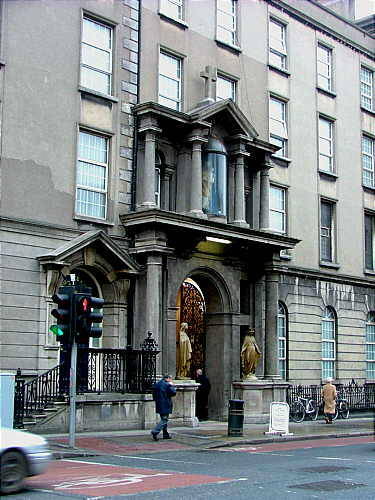 That is how St. Valentine’s remains (at least in part) came to be held at Whitefrair Street Church in Dublin, one of the city’s largest churches. They were forgotten for a time because the shrine was built in modern times. Here is a photo of the outside of Whitefriar Street Church. I haven’t been there, but it looks like you could walk right past it without realizing the history it contains. Update: I can now say I have been there! It seems to me that since so little is known about St. Valentine, Fr. Spratt might be the more interesting figure. He certainly gets lost in the story. He was charitable and showed the love of Jesus to the starving, the orphans, the homeless on the streets of the city where he was born and lived most of his years and died. He was so loved by the people that his death was mourned greatly. His example for the rest of us is something to strive for. I love my sweetheart, truly, but romantic love was not what the feast day was originally focused on. Just something to think about. I still think you should enjoy your chocolate today! This entry was posted in Dublin, History, Ireland, love, Valentine's Day and tagged Dublin, Ireland, Valentine's Day on February 14, 2015 by cthomson.